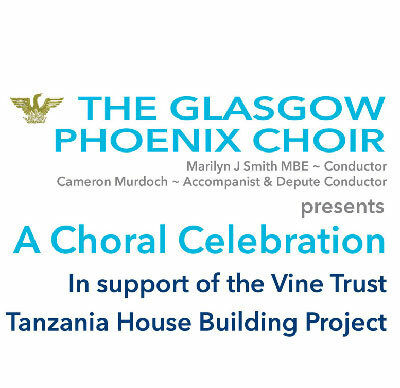 The Glasgow Phoenix Choir will be leading a Choral Celebration in support of the Vine Trust’s Tanzania House Building project. In May 2019, a group of ten volunteers from Falkirk Trinity will be making their way to Tanzania with the Vine Trust to help to build an orphanage. The team will work for around ten days in the Kazunzu area alongside local builders to get one of the first homes in the orphanage built. Each home will accommodate eight children and will have a vegetable garden to supplement their food supply. There will also be a school and a health hub located on the site along with a vocational centre. We have agreed as a church to raise £25,000 to fund the cost of the trip. As well as organising fundraising events, we will be looking for donations and for sponsorship. If you would like to find out more please contact the Church Office. The Glasgow Phoenix Choir rose out of the ashes of the world-famous Glasgow Orpheus Choir and this year celebrates 118 years of choral excellence – 68 years as the Glasgow Phoenix Choir and 50 years as the Glasgow Orpheus Choir. The choir flourishes under the guidance of our conductor Marilyn J Smith MBE and Cameron Murdoch, accompanist and depute conductor. The choir performs over 20 concerts per year and each involves a range of music from choral standards to new music and, in addition, we feature many delightful solo performances by choir members.